Joe and Blair Parsons are celebrating 10 years in business at Steamers Crab & Seafood Market in Millville. 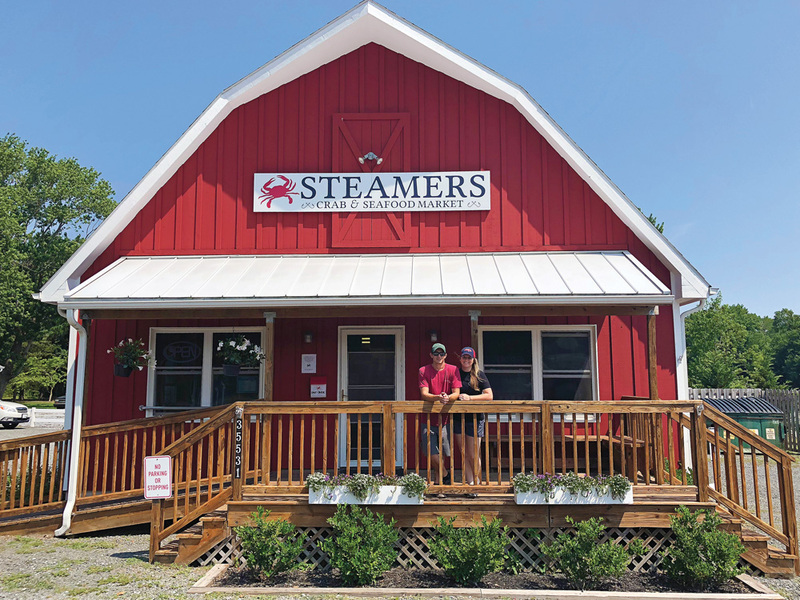 Steamers Crabs & Seafood Market opened their doors 10 years ago this summer, and the distinct red building on Route 26 in Millville continues to put out fresh seafood, tasty treats and, yes, steamed crabs. “That’s still the majority of our business,” said Parsons. “As a business model, that’s not the best thing to have — since the majority of your business is so weather-dependent and supply- dependent. Obviously, as the name would imply, crabs are the stars at Steamers. For many people here on vacation — or who live here year-round — crabs are just part of summer, like baseball or chasing fireflies. And as any true-blue crab-aficionado can tell you, “eating crabs” is as much an event as it is an activity. “We see crab-eating as sitting around with your friends and family for two or three hours, and enjoying the social aspect of it,” said Blair Parsons, Joe’s wife and now a steady presence at the store. To aid in that experience, Steamers is also now selling more “take-and-bake” meals, according to Joe, such as squid, shrimp and lobster salads, crab-and-Sriracha deviled eggs and smoked-salmon paté. The idea, said the Parsonses, is to make everything as easy as possible for their customers to enjoy a great meal at home. Blair also added that one change they have seen over the last 10 years is the infatuation with large crabs. She said the majority of crabs at Steamers are from Maryland and the Chesapeake Bay, and those aren’t always the biggest crabs, but that Joe personally inspects each crab before selling it, to make sure the crabs are full and heavy. Another request the people at Steamers regularly receive is to add dine-in eating. That’s probably not on the horizon. “Social skills,” added Joe, as if on cue. Blair mentioned Amber Adkins, who has worked for Steamers for nearly eight years. “She’s like family to us,” said Blair. The Parsonses have seen the sheer volume of business go up over the last 10 years, as well as more and more traffic, though Joe said he believes the road-widening project on Route 26 helped with some of the congestion. Steamers is located at 35531 Atlantic Avenue in Millville. They can be reached at (302) 539-6700, or online at steamerscrabs.com.